ERCC1 antibody recognizes the DNA excision repair protein ERCC-1, also known as excision repair cross-complementing rodent repair deficiency complementation group 1. Mouse anti Human ERCC1 antibody recognizes the DNA excision repair protein ERCC-1, also known as excision repair cross-complementing rodent repair deficiency complementation group 1. The product of ERCC1 functions in the nucleotide excision repair pathway, and is required for the repair of DNA lesions such as those induced by UV light or formed by electrophilic compounds including cisplatin. The encoded protein forms a heterodimer with the XPF endonuclease (also known as ERCC4), and the heterodimeric endonuclease catalyzes the 5' incision in the process of excising the DNA lesion. The heterodimeric endonuclease is also involved in recombinational DNA repair and in the repair of inter-strand crosslinks. Mutations in ERCC1 result in cerebrooculofacioskeletal syndrome, and polymorphisms that alter expression of ERCC1 may play a role in carcinogenesis. Multiple transcript variants encoding different isoforms have been found for ERCC1. The last exon of ERCC1 overlaps with the CD3e molecule, epsilon associated protein gene on the opposite strand (provided by RefSeq, Oct 2009). 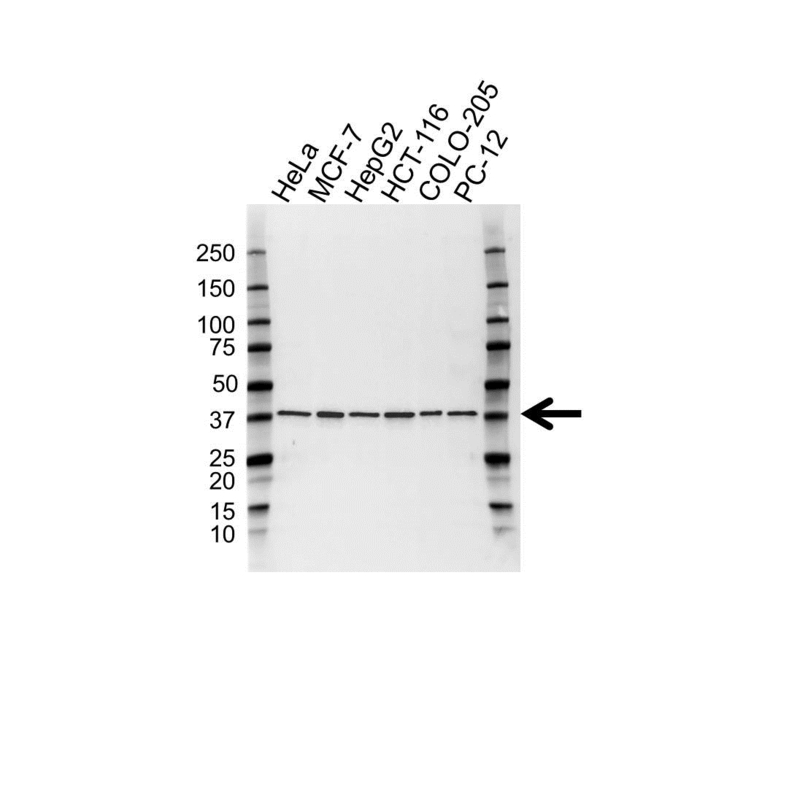 Mouse anti Human ERCC1 antibody detects a band of 39 kDa. The antibody has been extensively validated for western blotting using whole cell lysates.